ing less than 0.01 pF across the component itself. The Scanner System is composed of two main units, the 1771 Scanner Control and the 1772 Scanner Switch. The components under test are connected to the switch unit by long cables, each consisting of 10 wires in a single shielded bundle. The switch unit is similarly connected to the control unit by a long cable. This arrangement is extremely adaptable, since the components can be separated from the switch unit, which can in turn be separated from the control unit. In environmental testing, for example, components in a test chamber can be connected to the switch unit outside the chamber by the cable bundle. The arrangement also allows expansion of the channel capacity, since several switch units can be connected to a single control unit. The 1772 Scanner Switch accepts up to 10 plug-in reed-switch modules. Two types of switch modules are available: the 1772-P1 SPST Scanner Module and the 1772-P2 SPDT Scanner Module. Each module can accept 10 input lines and connect them sequentially to one output line. The 1772-Pl SPST module connects the input lines, one at a time, to the output line and leaves the unused lines open. The 1772-P2 SPDT module operates in the same manner except that the inactive input lines are connected to a common (ground) terminal. Figure 2 shows the use of these modules in the guarded scanning of two-terminal components. Only three of the 10 input channels are shown. Note that this connection places the stray capacitance of the inactive channels between the low output terminal and ground rather than across the output terminals. This connection is shown more clearly in Figure 3. Figure 2. Simplified schematic diagram showing connections for guarded scanning of two-terminal components. Figure 3. 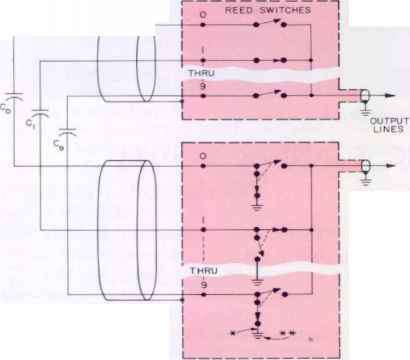 Simplified schematic diagram of scanner switching circuit. Each module uses long-life reed switches capable of over 25 million operations. Total channel resistance is less than 200 milliohms. The 1772 Scanner Switch can accept 10 modules of either type and can provide, for example, a scanning capacity of 50 two-terminal components or 100 single-terminal signal lines. Figure 4 shows a 1770 Scanner System used with a 1680-A Automatic Capacitance Bridge Assembly. The 1772 Scanner Switch is shown at the left, housed in a 5)^-inch-high relay-rack cabinet. All connections are made at the rear of the unit. The 1772-P1 and -P2 Scanner Modules plug in as shown. Each module includes a 14-pin connector for the input lines and two parallel bnc connectors for the output lines. One bxc output connector can be used for connection to the external measuring instrument and the second to other modules. The main chassis has two connectors, one for connection to the 1771 Scanner Control and one for connection to other Scanner Switches. Two 50-foot rolls of 10-conductor shielded cable are supplied for connection to the input lines. Figure 4. Scanner system connected to automatic bridge. Scanner switch Is at left; control unit Is above the bridge. multiple channels. The instrument has thumb-wheel switches for channel selection and a bright in-line numerical readout of the active channel. An electrical readout is also provided, along with various other electrical inputs and outputs. (6) Remote, in which any mode of operation can be selected by contact closures applied to a rear connector. Figure 5. 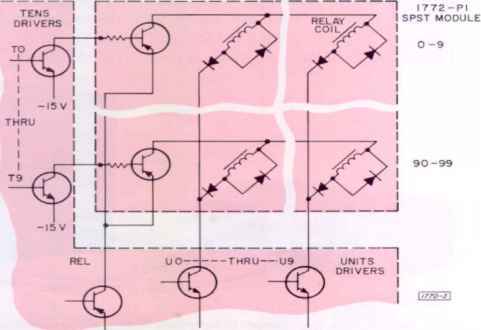 Simplified schematic diagram showing interconnections between control unit and switch unit. Figure 6. Bridge-scanner system used in environmental tests on dipped-mica capacitors. Photo courtesy of the Electro Motive Manufacturing Co., Inc.
of this interval an output signal is generated to operate the bridge. At the same time, a third interval, adjustable from 100 milliseconds to 25 seconds, is initiated. In the single scan or continuous scan mode the scanner advances to the next channel at the end of this interval unless a signal from the bridge has caused it to advance sooner. Front-panel terminals allow the operator to monitor the delay signals on an oscilloscope. Figure 5 shows a simplified schematic diagram of some of the interconnections between the Scanner Control Unit and the Scanner Switch Unit. Two decade counters in the Scanner Control Unit determine the active channel by means of the matrix ("crosspoint") connection shown. 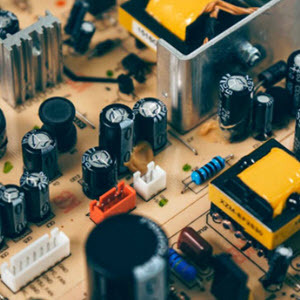 For example, if the tens decade is set to 0 and the units decade to 9, tens-driver transistor TO and units-driver transistor U9 will be held in saturation, connecting the coil of reed switch 09 between and the —15-volt supply. The diodes in series with the reed-switch coils allow the matrix to operate, while those in parallel with the coils prevent the surge transient from damaging the driver transistors. The coil-return line, REL, is connected through a normally saturated transistor to I REp- This transistor is cut off for the reset operation, disabling all channels. The channel-driver transistors can supply up to 80 mA. The reed-switch coils 'in the 1772-P1 SPST Scanner Module require 15 mA and those in the 1772-P2 SPDT Scanner Module require 30 mA. Thus one Scanner Control Unit can drive, for example, four 100-channel single-wire Scanner Switch Units (10 1772-Pl SPST modules in each) or one 100-channel guarded-two-terminal scanner consisting of two Scanner Switch Units (10 1772-Pl SPST modules in one and 10 1772-P2 SPDT modules in the other). Harold T. McAleer received the B.S.E.E. and M.S.E.E. degrees from the Massachusetts Institute of Technology in 1953. He was employed as a cooperative student at GR on the design of high-frequency measuring and recording instruments. After two years' service as an engineer with the U. S. Army Signal Corps at Fort Monmouth, he returned to GR as a development engineer in GR's Frequency Group, where he designed frequency counters, and associated instruments. Since early 1966 he has been responsible for the design of systems at GR. He is a registered professional-engineer and a member of the IEEE, Eta Kappa Nu, Tau Beta Pi, and Sigma Xi. Richard F. Sette, designer of the 1781 Digital Limit Comparator and 1770 Scanner System, received the B.S.E.E. and M.S.E.E. degrees from Northeastern University in 1960 and 1962, respectively. He performed graduate research in solid-state physics at the Air Force Cambridge Research Laboratory and later served in the U. s. Army Electronics Laboratory at Fort Monmouth, where he was concerned with the testing and evaluation of integrated circuits. Since joining GR in 1964 he has been responsible for the design and development of data-processing equipment for automatic testing systems. He is a member of the IEEE and Eta Kappa Nu. Figure 6 shows the 1770 Scanner System used with a 1G80-A Automatic Capacitance Bridge Assembly at Electro Motive Manufacturing Company in Willimantic, Connecticut, to perform environmental-performance inspection of high-reliability dipped-mica capacitors. The capacitors are checked in an environmental chamber over a range of — 55 to +150°C. 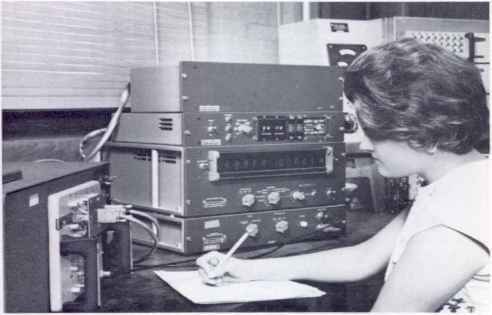 In another custom-designed measurement system, a 1770 Scanner System is used in the testing of touch-dial-telephone inductors. By use of the random-access mode, external programming equipment is used to connect a prescribed group of inductors, first for demagnetizing and then, after a known time interval, for measurement. The flexibility of the scanner system makes it ideal for this application. The 1770 Scanner System can be used for signal-line scanning with either type of switch module. The 1772-P2 SPDT Scanner Module is constructed so that terminating resistors can be automatically connected to inactive channels (see Figure 2). The scanner system can also be used in reverse as an output scanner, to connect a single input signal to many output terminals in sequence. In one such application, for example, two scanner switch units are operated from one control unit. One of the switch units connects input signal lines one at a time to a measuring instrument, while the other switch unit connects the output of the instrument to a multiple-channel recorder.